We have an excellent track record. Please see some of our ICD-10 success stories. Click the hyperlinks for details about our ICD-10 Assessments as well as Revenue Cycle, Medical Policy, and Clinical Documentation best practices expertise. 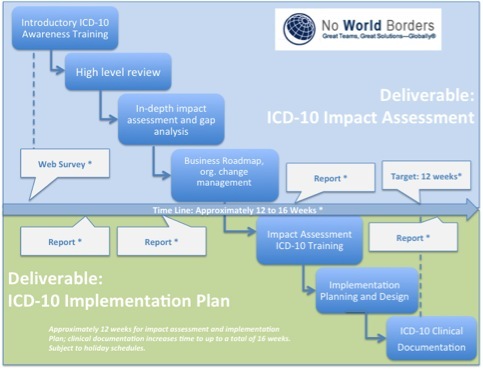 There is also more information on our ICD-10 Business Roadmap work and ICD-10 Consulting Methodology. 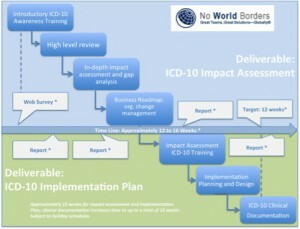 Our ICD-10 testing, ICD-10 training for coders and ICD-10 physician specialty provider training and ICD-10 Risk Analytics help provide a complete solution for visibility into all aspects of the ICD-10 transition for health plans, health care providers, self-insured employers, Healthcare IT firms, medical device and pharmaceutical companies. We use a proven methodology including these components. Click the image for a high resolution view. © Copyright No World Borders. Not to be reproduced in whole or in part without written permission.